Meet the Mud Daddy portable mud and dirt washing brush, ideal for grooming muddy dogs - but also suitable for use on bikes, boots, tools and virtually any other muddy item under the sun that needs cleaning quickly and easily. The Mud Daddy Washing Brush works without electric or battery power, using a combination of water and air pressure to deliver the power you need the all-natural way. You can fill up your Mud Daddy with warm or cold water, or mix with miniature shampoos if you wish. 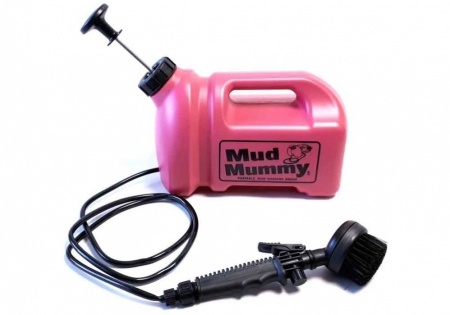 The gentle low pressure, combined with the supplied brush will remove any dirt or mud. Give the Mummy around 15-20 hand pumps and this will give you approximately 3 minutes of wash. In total, the Mud Daddy 5L will give you 10-12 minutes of wash time.